Beyond the obvious costs to the victims, the RDI program imposed painful costs on the State of North Carolina and on the nation. The federal government’s use of torture undercut national security in numerous and profound ways. It undermined the United States’ moral standing in the world, which is critical to promoting international cooperation and the rule of law. Among other costs, the program produced faulty intelligence; eroded key counterterrorism partnerships; turned terrorists into martyrs, and led to infighting, rather than critically needed cooperation, amongst the nation’s intelligence agencies. The use of torture continues to impede ongoing efforts to prosecute those responsible for the 9/11 attacks and other heinous acts. In addition, participation in torture damages perpetrators and their communities including, in this case, the State of North Carolina. 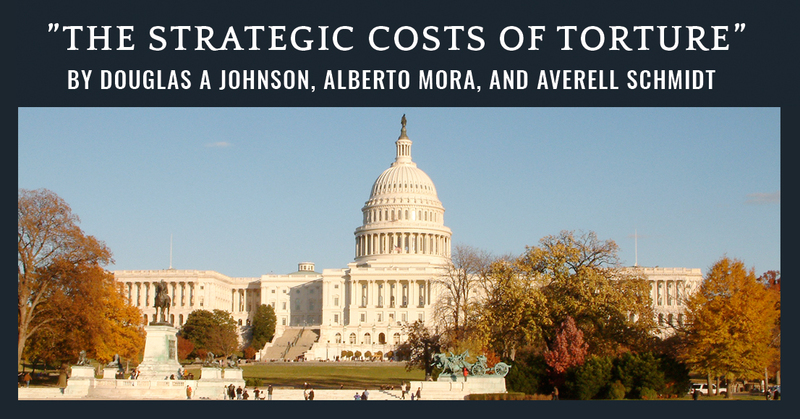 This chapter addresses each of those costs in turn. Torture produces information that may be inaccurate, unhelpful, and even misleading for intelligence-gathering purposes. In an effort to make the torture stop, the individual being harmed may say anything, including what the interrogator appears to want to hear, whether or not it is accurate. This is illustrated repeatedly by CIA documents quoted in numerous places in the declassified summary of the SCCI Report. For example, “[Hambali] said he merely gave answers that were similar to what was being asked and what he inferred the interrogator or debriefer wanted, and when the pressure subsided or he was told that the information he gave was okay, [Hambali] knew that he had provided the answer that was being sought.”700 Traditional interrogation techniques are most likely to achieve the disclosure of useful and accurate information: building rapport, taking advantage of the captive’s desire for normal human interaction, demonstrating awareness of and respect for the subject’s culture, background, and motivations, and showing awareness of possible evidence of criminal activity by the suspect. As Ali Soufan, a former FBI interrogator with extensive experience questioning members of al-Qaeda, testified to the Senate Judiciary Committee, the so-called “enhanced interrogation techniques” are ineffective and unreliable. Soufan explained that traditional interrogation techniques are most likely to achieve the disclosure of useful and accurate information: building rapport, taking advantage of the captive’s desire for normal human interaction, demonstrating awareness of and respect for the subject’s culture, background, and motivations, and showing awareness of possible evidence of criminal activity by the suspect.706 Using physical or mental torture undermines all of these dynamics of successful interrogation. Steven Kleinman, U.S. Air Force Colonel and expert in interrogation, human intelligence, and survival and resistance training, testified to the NCCIT that behavioral science researchers have “uniformly concluded that torture is an ineffective means of gathering reliable information.”707 Kleinman detailed the ways in which torture, first, undermines and corrupts memory and, second, diminishes cooperation by the person who experiences it. Core attributes of torture, such as infliction of fear and pain and manipulation of the body’s circadian rhythms, impede accurate recall. Interrogations that feature “leading and loaded questions” can “permanently alter memory.”708 Moreover, coercive interrogation techniques that aim to break the subject’s will by producing debility, dependence upon the interrogator, and dread of what else might happen may make the subject feel helpless; however, they also increase his or her antagonism toward the interrogator. Kleinman emphasized that extensive empirical research and field validation studies demonstrate that rapport-based, information-gathering methods are dramatically and consistently superior in eliciting accurate and comprehensive information.709 The use of torture shifted attention from the heinous acts of al-Qaeda and others responsible for 9/11 to the misdeeds of the United States in response. The Commission is aware that some former CIA officials and government officials have disputed the conclusions of the SSCI Report.710 Given this crucial discrepancy, it is essential for the public to have access to the full 6,700+-page investigative report, which remains classified. Our team of researchers at the Carr Center for Human Rights Policy at the Harvard Kennedy School [. . .] has found that Washington’s use of torture greatly damaged national security. It incited extremism in the Middle East, hindered cooperation with U.S. allies, exposed American officials to legal repercussions, undermined U.S. diplomacy, and offered a convenient justification for other governments to commit human rights abuses. International partnerships were strained on various fronts. Britain released detainees of interest in Iraq because it did not have facilities to detain them, and it feared the U.S. would not respect the captives’ fundamental human rights.714 The Netherlands delayed sending troops to Afghanistan from 2003 to 2006 in part because of concerns with the United States’ use of torture.715 Australian, Canadian, British, and New Zealand military lawyers approached Alberto Mora, then General Counsel to the U.S. Navy, and warned him in 2005 that their cooperation with the U.S. on the whole range of war on terror activities would decline if the U.S. continued to engage in torture.716 These concerns undoubtedly made U.S. efforts to suppress terrorism more difficult. The secret renditions also led to direct conflict between the U.S. Department of State and the CIA. When the International Committee of the Red Cross wrote to the U.S. government with a detailed list of individuals being detained under the control of the CIA in a redacted country, the State Department told the ICRC that U.S. policy was to encourage that country and all countries to give the ICRC access to detainees.723 At the same time, the CIA repeatedly directed the same country to deny the ICRC access. According to the SSCI Report, the contradiction “created significant tension” between the country involved and the U.S.724 Such episodes seriously impede the U.S. government’s ability to persuade other nations to cooperate, and to refrain from holding individuals in secret detention. Citizens vigil at the Johnston County Airport. The use of torture in the RDI program has made it difficult to prosecute those involved in the 9/11 attacks and other acts of terrorism, creates enormous challenges for prosecutors and defense counsel alike, and continues to hamstring efforts to obtain justice for the victims of terrorism. The use of torture was so clearly illegal and indefensible that when sued over it, the U.S. government hid its actions by resorting to a distortion of the “state secrets” doctrine. By stretching the doctrine far beyond its original purpose, the government claimed immunity for itself and private defendants on the grounds that a judicial proceeding would compromise national security by forcing the revelation of state secrets. Such a self-serving approach further eroded the credibility of the U.S.’ claimed adherence to human rights and the rule of law. The Commission heard testimony from ACLU attorney Steven Watt, who summarized four cases brought by victims and survivors of the RDI program in U.S. courts between 2004 and 2015. All four cases were dismissed on the basis of immunity or “state secrets,” “without any consideration of whether the men were in fact forcibly disappeared and tortured,” and despite the fact that much information about the cases was already in the public domain.729 The use of torture in the RDI program has made it difficult to prosecute those involved in the 9/11 attacks and other acts of terrorism, creates enormous challenges for prosecutors and defense counsel alike, and continues to hamstring efforts to obtain justice for the victims of terrorism. Innocent or guilty of terrorist connections, what unites all known RDI victims is their Muslim identity. As Dr. Maha Hilal wrote to the NCCIT, the now-discredited legal rationale for RDI – that anything short of organ failure or death would not constitute torture733 – was drawn up specifically for those deemed “enemy combatants,” a category entirely populated by Muslims.734 Yet surprisingly little effort has been made to understand the extent to which Americans’ unusually high level of acceptance of official torture735 may be based on Islamophobia and related forms of discrimination. Dr. Hilal writes to the NCCIT: “Rectifying the abuse of CIA torture must necessarily include an acknowledgment of who was tortured – Muslims – and what mechanisms need to be put in place to remedy the deep levels of dehumanization that have long justified their torture.”739 A danger in allowing a torture program directed against Muslims to remain unaccountable is that it expands the definition of what is considered allowable government treatment of Muslim populations. A vigil outside the office of the U.S. Attorney for the Eastern District of North Carolina, 2015. More recently, the ECHR ruled that Lithuania and Romania violated the rights of two al-Qaeda terror suspects by allowing the CIA to torture them and ordered that both countries pay monetary damages to the two, both of whom remain detained at Guantánamo.743 The RDI program relied heavily on North Carolina’s public infrastructure, military installations, and private corporations. As such, the program damaged the State of North Carolina and implicated its citizens in torture and other human rights violations. The RDI program relied heavily on North Carolina’s public infrastructure, military installations, and private corporations. As such, the program damaged the State of North Carolina and implicated its citizens in torture and other human rights violations. The failure to account fully for North Carolina’s role in the RDI program extends those damages into the present. Through a series of media reports,749 there is growing national and international awareness of the state’s rendition history and refusal to investigate rendition flight allegations. Fifteen years of official tolerance for torture-related activities from public airports have likely affected North Carolina’s national and international image. Economic development plans that involve partners from anti-torture countries could be endangered, particularly as other countries pursue the kinds of accountability measures noted above. Since Aero’s role in torture was revealed, the North Carolina Department of Transportation has given several grants to the Johnston County Airport for maintenance and security without requiring the airport authority to take action regarding criminal activity by its tenant, Aero Contractors.750 State elected officials oversaw the Kinston Global TransPark, funded by state taxes, while Aero operated an important rendition aircraft based there. Through these activities, all taxpaying residents of North Carolina became complicit in the hosting of torture infrastructure. A considerable level of frustration is felt by local citizens when their governments persistently fail to uphold the rule of law.751 When elected officials refuse to acknowledge the concerns of their constituents, public distrust grows, and some citizens are alienated from the political process. Most elected officials have been silent on the role of North Carolina’s public and private infrastructure and employees in the CIA program (Chapter 8 addresses the role of state authorities in more detail). The exception has been Johnston County commissioners’ defense of Aero Contractors and torture. The combination of silence and support for torture stifles valuable public debate on what constitutes the public good and how the State of North Carolina should fulfill its obligations to both its citizens and the rule of law. The CIA’s secret rendition and torture program substantially damaged the reputation of the United States, its national security, and its democracy. These negative effects are ongoing, and are unlikely to be repaired without: a thorough, public accounting for what occurred; substantial criminal and financial punishments for the persons responsible for carrying out the torture program, which are required as matters of state, federal, and international law; and appropriate redress for the individuals who suffered rendition and torture without due process of law. The lack of accountability increases the likelihood of the use of torture as U.S. policy in the future. It also weakens the ability of the United States to convince other governments not to torture. Furthermore, because the RDI program relied so heavily on North Carolina’s infrastructure and public and private actors, the abuses of the program also damage the reputation of the state and make its citizens unwittingly complicit in violations of human rights.